This week has been macaroon week in my house - on Thursday night I made a batch of Nigella Lawson's pistachio macaroons (How to be a Domestic Goddess), and they went down so well that I reprised the recipe on Saturday for a very belated Father's Day lunch, in addition to a batch of Nigella's chocolate macaroons. 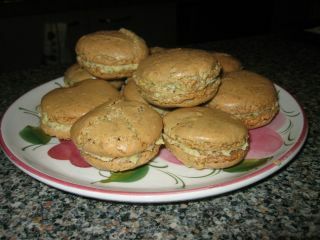 These photos are from my first pistachio macaroon making attempt, on Thursday night. 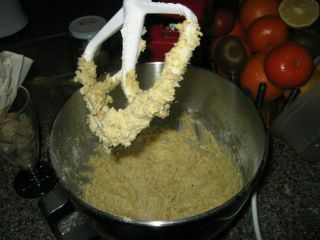 The pistachio macaroon mixture itself is very simple - ground pistachios and icing sugar folded into a meringue mixture. You then pipe them onto a tray, and bake for 12 minutes. You're supposed to let them sit for 15 minutes "to form a skin" before baking, but in my rush to get them in the oven before the egg whites deflate, I forgot this step each of the 3 times I've made macaroons. Now, the recipe states that it will make 40 rounds, which you then sandwich together to make 20 macaroons, but I only got half that amount. However, upon consulting a pistachio-macaroon-making-expert friend of mine, I found out that they need to be made teensy-weensy if you want to get that amount. Furthermore, she advised me that you should halve the quantities for the filling, as "half is more than enough". The buttercream is simply butter, beaten until smooth, with icing sugar and ground pistachios added. Once baked and cooled (they hardly take any time to cool), you sandwich the macaroons together with generous amounts of the buttercream, and watch mouths water. Finished product of my first attempt. As you can see, they are quite large, and perhaps not as elegant as they could be, but they do taste amazing. Nigella describes these macaroons as "biscuit bliss", and I'm quite inclined to agree with her. Between my family and myself (mainly myself), these biscuits were devoured by Friday afternoon. On Saturday, for our belated Father's Day lunch, in addition to the macaroons, I made Dad his favourite dish - Nigella's Saffron-Scented Chicken Pilaf, from Forever Summer. This is a staple family dish that I've made a million times before, so much so that I know the recipe off by heart and I forgot to take a photo of it. Sorry! 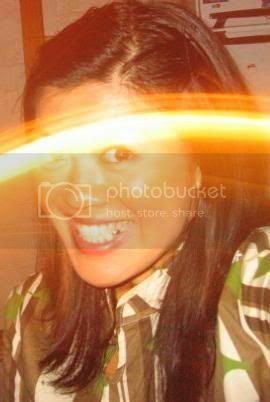 I suggest that if you want to know what it looks like, you make it yourself. This way, you'll get to eat it too. Infintely more rewarding. So anyway, the pistachio macaroons were just the same as the first time, although I did pipe more judiciously, and managed to get 40 rounds out of it. The chocolate macaroons are quite simple - icing sugar, ground almonds and cocoa folded through meringue - baked in the same way as the pistachio version. 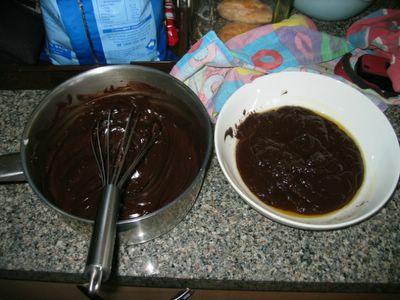 The filling is a simple ganache of cream, chocolate and butter melted in a pan. Although I suppose "simple" is a relative term, as I managed to screw it up by leaving it on the heat too long so that it separated and went feral. 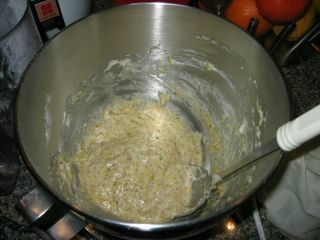 So I started again, putting it on the lowest possible heat until just melted, and then whisking it until thick and smooth. Ta-dah! Both chocolate and pistachio versions are delicious and compulsive, but the consensus from my family is that the pistachio ones are indeed the best. When I was in London, I tried some delicious Parisian macarons from Pierre Hermes and Ladurée, in at least a dozen different flavours. 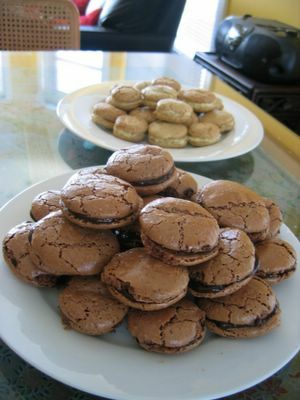 I'd love to try making my own macaroons in various, exotic flavours. Does anyone have any suggestions?? Sarah, both kinds look amazing, well done! That looks great! I'm looking forward to tasting Parisian macarons. Laurent has them in all sorts of colours here... I can't remember the flavours but I think there was pistachio, cherry and lemon. Your macaroons are gorgeous. I had my first macaroon last month - a pistachio one - and really enjoyed it. I didn't realize they were so easy to make. Congrats, those babies lookk good! I love Pierre Hermé's, sooo delicious! Thought you might enjoy my narrative poem "The Tycoon Who Craved Macaroon". Thanks for the recipe! Awesome! They look pretty good. I had some macaroons at Meite in San Francisco and their cookies were rather large in depth than in width. Have any ideas on what they put into their flour to get such height? 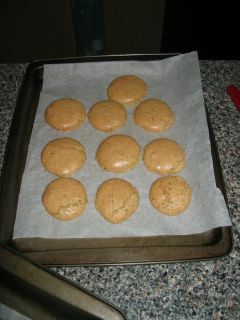 I tried making these tonite and the macaroons were completely flat when I took them out of the oven. Also, how do you fold in the pistachio-dust to the meringue without stirring--says to "fold," but I think that may be my problem!? Help!! Basically folding means to stir in gently, so that you incorporate the dry ingredients without deflating the beaten egg whites. Maybe you added the pistachio dust too roughly? Not sure though. La duree is amazinng... nothing beats the caramel and salted butter one as yet though. My luxury overpriced addiction! I've yet to master piping but given that I have all these recipe books I should give it a shot. The recipe book I used was The Roux Brothers on Patisserie, but given that I'm ham handed, I don't think sifting the ingredients twice added much. Alternative to leaving to form a skin, is to "bake for 2-3minutes at gas 7-8 and transfer to another oven at gas 4 for 6 minutes" That's if you have two ovens naturally! !